Here’s a real hearty, German, bring-me-back-to-the-Midwest sort of meal! It’ll fill your family’s bellies and also be on the table in 30 minutes!! Kids also enjoy this meal with the sweet apples, potatoes and mildness of the pork…now for the adults, go ahead and pour yourself a glass of hard cider to go with and enjoy! Begin this simple Midwest influenced dinner by seasoning both sides of the pork chops with the sage, thyme leaves, salt and pepper. Set the pork aside and slice up the onion and apples. Heat a large pan to medium-high and add in the olive oil and butter. Sear each side of the pork chop for 3-4 minutes (a nice brown color) and set aside again. In that same pan, add in the sliced apples and onion and saute for 6 minutes (till onions start to soften and turn translucent); add in the hard cider and the apple cider vinegar and bring to a simmer. Return the seared pork chops to the pan, cover and cook for 5 more minutes. 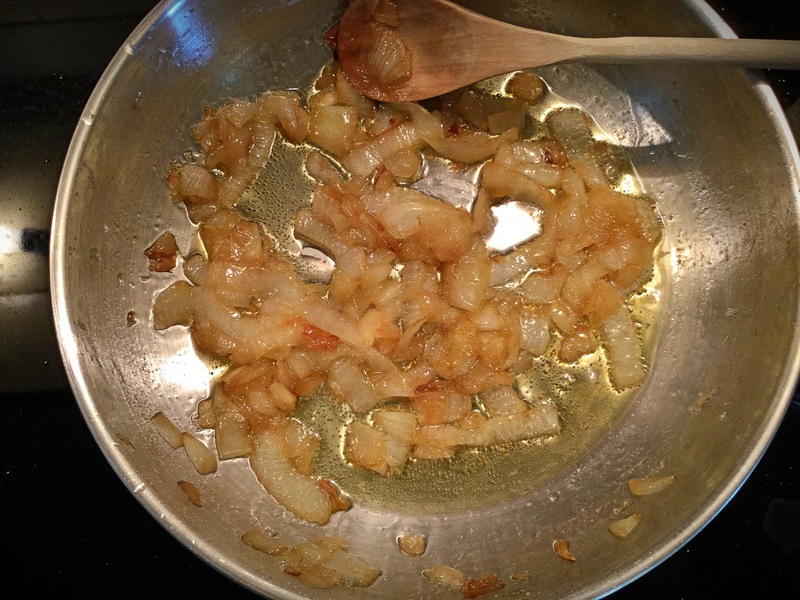 Serve along with potatoes with the juices from the apples and onions drizzled overtop, enjoy! Feel free to make your spuds as you wish or maybe change it up everytime you prepare these chops, but here’s how I did ours. First put the potatoes into a large stockpot of salted water till just covered. Bring to a gentle boil and the cover pot with lid. Allow to cook for about 15 minutes. Till JUST soft when you stick a fork in them, not falling apart. Drain and remove from pot and when just cool enough to handle, dice up into cubes and season with kosher salt & pepper. *sometime I’ll sprinkle on seasoned salt or smoked paprika, etc. Heat up a cast-iron pan to medium heat and then add 1-2 tbsp (canola) oil. Add in cubed potatoes and allow to cook, not stirring to often, to create a nice “char” on them. Enjoy! Ok, I made this treat of a dinner tonight just for myself. Yes, I made an entire 2 lb+ meatloaf and a jar of bacon jam for MY dinner. Do you want to know why?? Because quite frankly it’s delicious and it only gets better after the next day or two, especially that Bourbon Bacon Jam!! Which is why it’s a great “leftovers” type of meal! 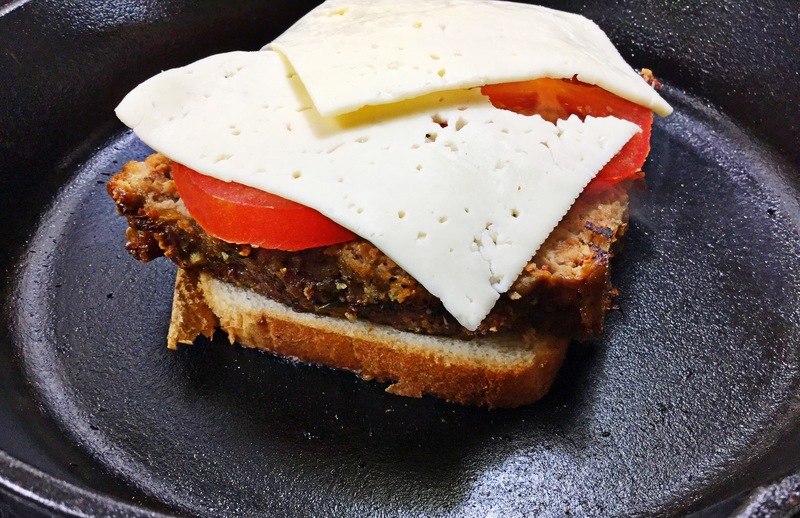 Let’s say you made the traditional meatloaf and mashed potatoes for dinner one night and you’re not wanting the same darn thing the next..Well, simply add the Bacon Jam and garnishes to a meatloaf sandwich and you’ve taken repurposing to an entire new level! *This jam is good off a plain spoon, but spread it on a warm slice of toast or English muffin topped off with a fried egg. Now THATS a rave worthy breakfast! 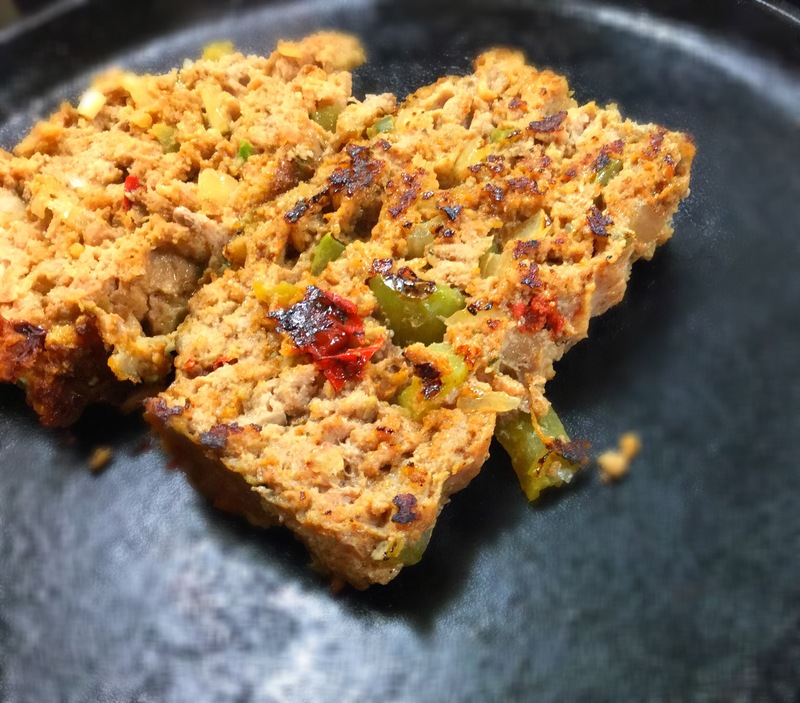 As I stated earlier, this can all be made ahead of time or at seperate times if using as a “leftover” meatloaf meal…but let’s pretend that you’re doing what I did…let us start from the beginning! 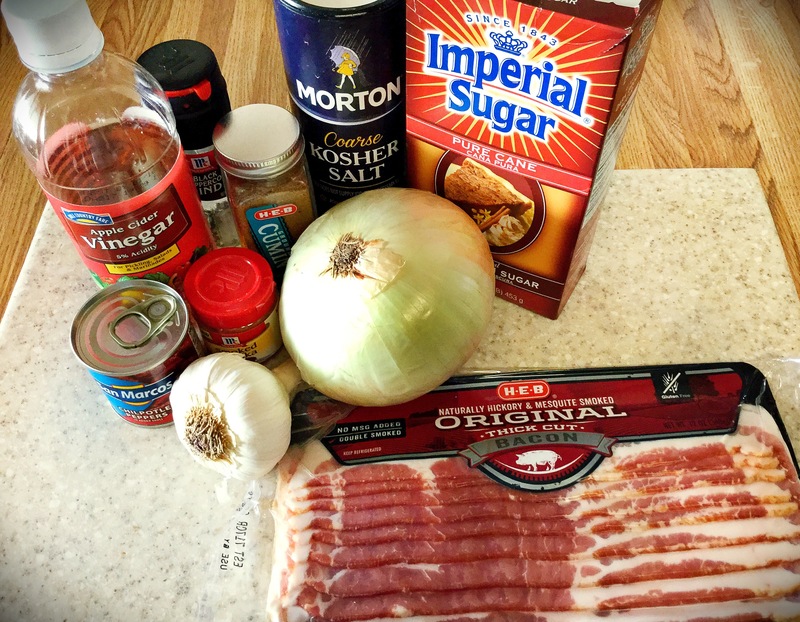 Bourbon Bacon Jam time my friends! 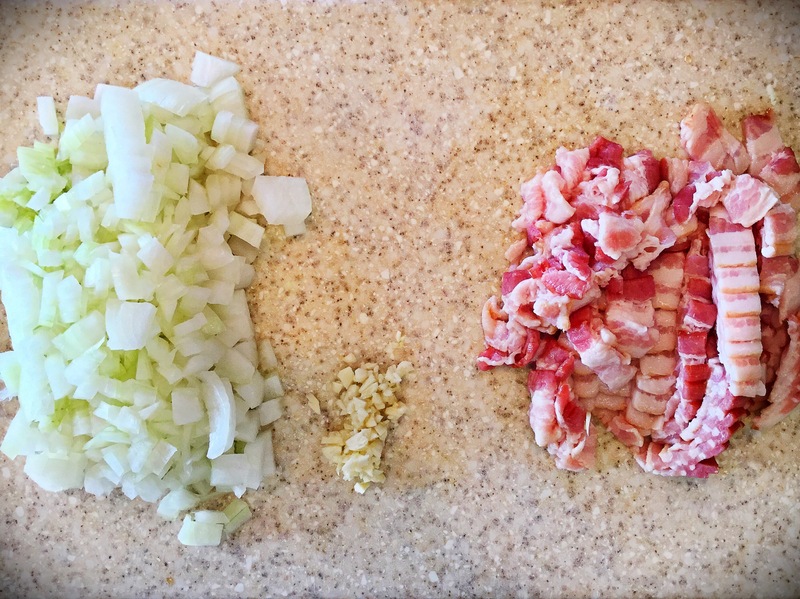 Start by chopping, dicing and mincing the bacon, sweet onion & garlic. 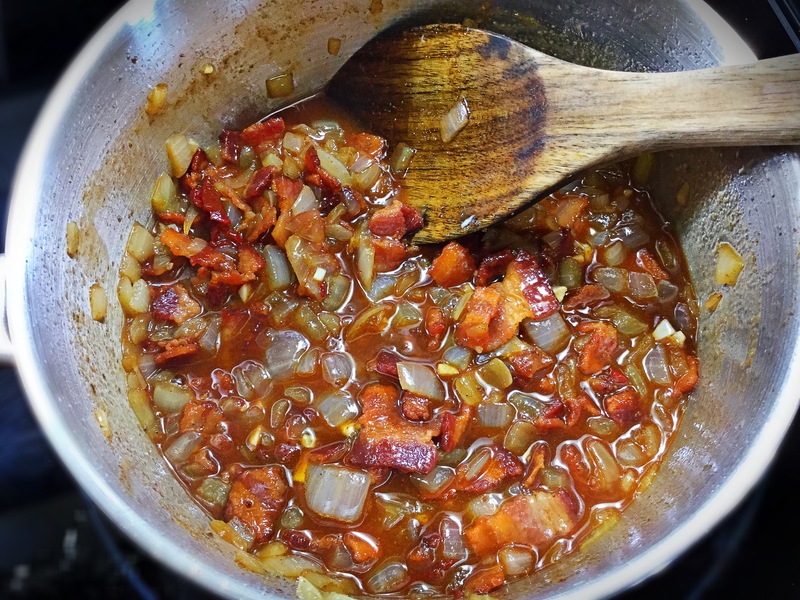 In a large sauce pan (*if not nonstick, add a tbsp of EVOO), cook your chopped bacon until slightly crisp. 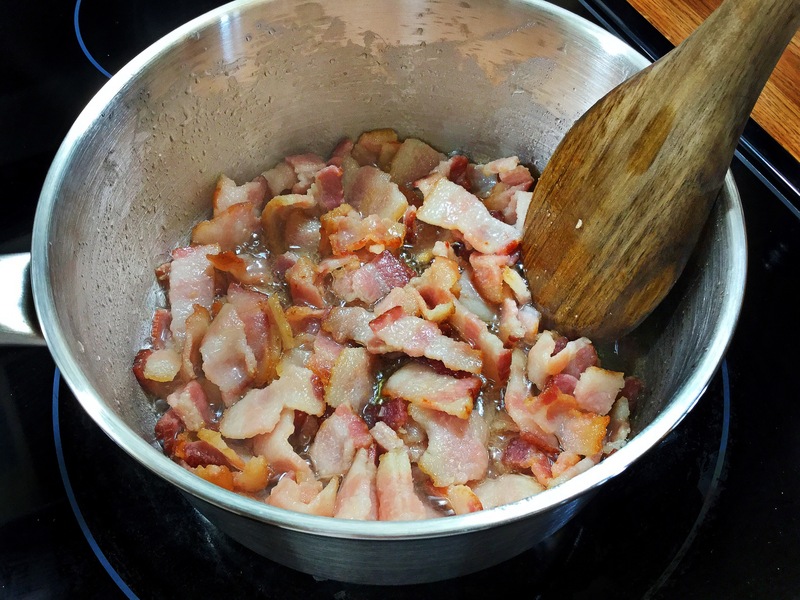 Transfer the bacon to a paper towel lined dish and set aside. In that same pan with the reserved bacon grease, add in the chopped onions and cook down for about 10-15 minutes. 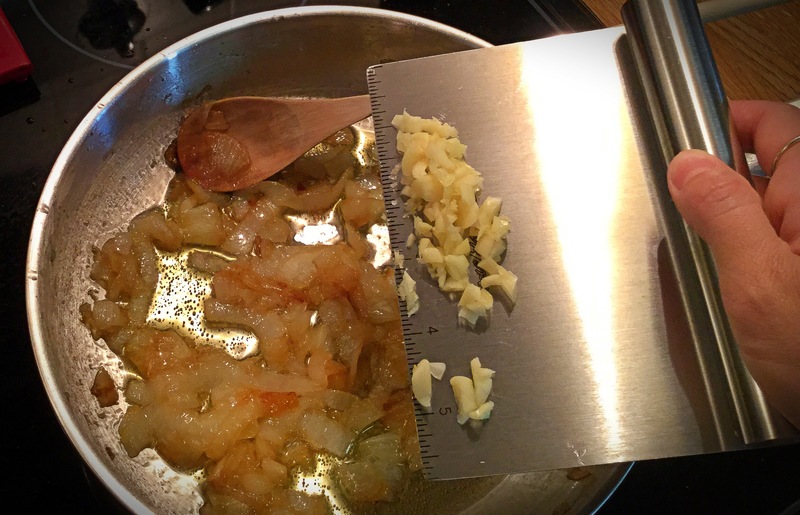 Add the minced garlic to the onions and continue to cook for another few minutes. 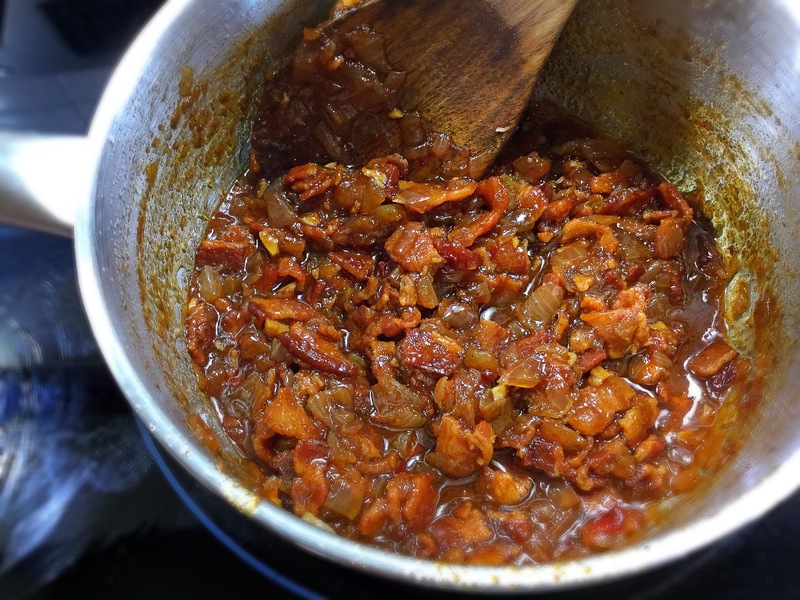 Now to the onion-garlic mix, add in all of the remaining ingredients (diced chipotle pepper & sauce, dark brown sugar, apple cider vinegar, bourbon, smoked paprika, cumin, salt & pepper and the cooked bacon) and stir to combine. Bring to a low boil and then down to a simmer. Let stand uncovered and do its thing while stirring occasionally. *I like to leave it on the stove top on low for a good 2-3 hours and carefully drain the liquid from the pot about once an hour. It’ll really thicken up! Once done you can either transfer to a food processor to thin or leave as is. I, myself, prefer it chunky for texture and leave it as is. Keep in a mason jar or Tupperware container in your refridgerator, it’ll be gone FAST! So while that Bourbon Bacon Jam is rendering away, we’ll begin the meatloaf. 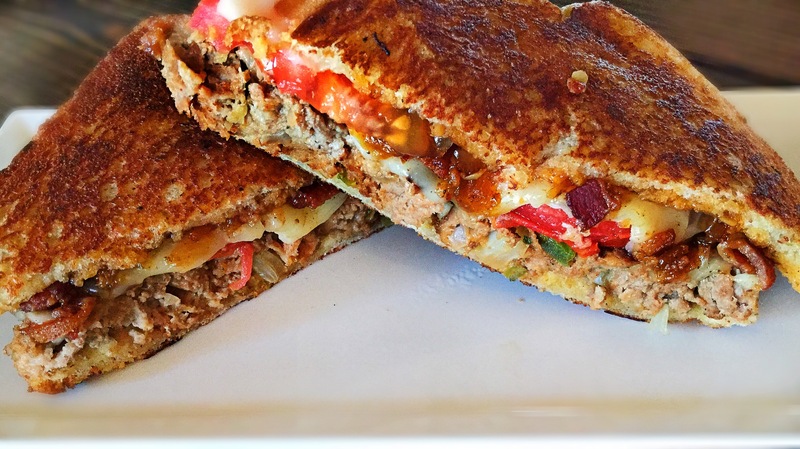 Now this is a basic meatloaf recipe, and if you have a personal favorite then please feel free to use it! *Ok, ok..I can hear you now. “Carly, why does there have to be chipotles/jalapeño in the meatloaf? ?” 1.Because 2. Why not? 3. My 2 & 4 year old boys eat it and have no idea, it’s NOT really spicy 4. You need to finish off that can of Chipotles anyway and 5. Your combining it with a SWEET bacon jam. You NEED the contrasting flavors. It’s the little things that make food great! Now back to the task at hand. Meatloaf. Preheat your oven to 350 degrees and get whatever pan you use to cook your meatloaf in out and greased if not non-stick. 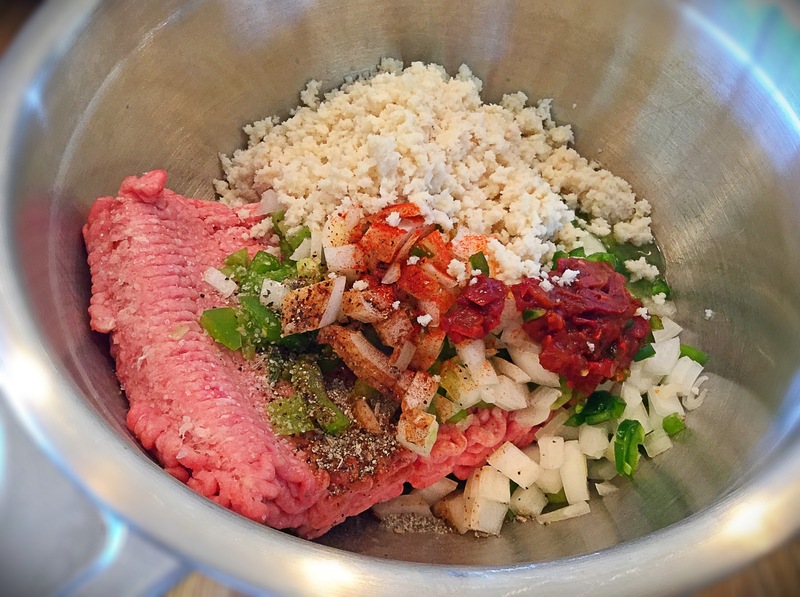 In a large bowl, combine ALL of the meatloaf ingredients together and gently mix with your hands. 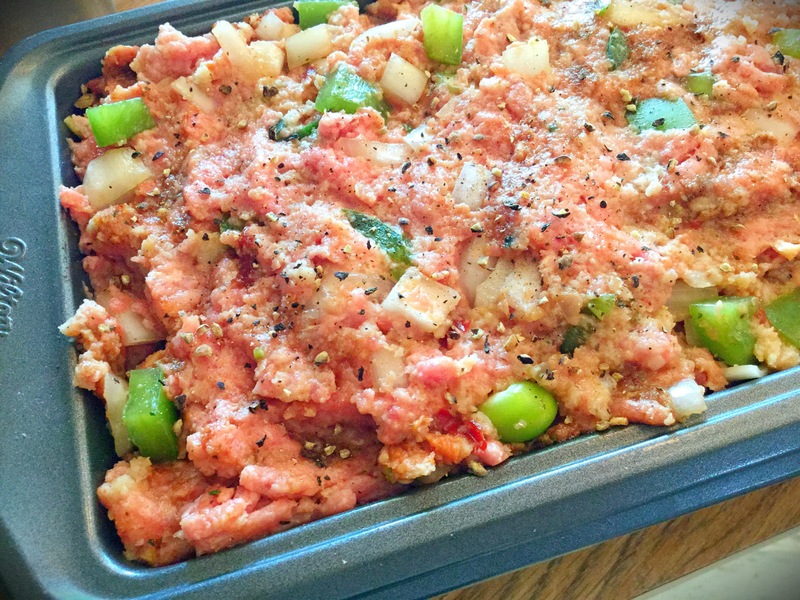 Transfer the mix to your baking pan and again, gently, pack into meatloaf shape. Crack some more black pepper and salt over top and place into the preheated oven for about 1 hour, uncovered. Remember, while the meatloaf is baking your Bourbon Bacon Jam is still rendering away and smelling devine! I dare you to tell me your haven’t inhaled a few spoonfuls already…. Now that the meatloaf has finished cooking, it’s assembly time! Have 1-2 saute pans heating on the stove top. 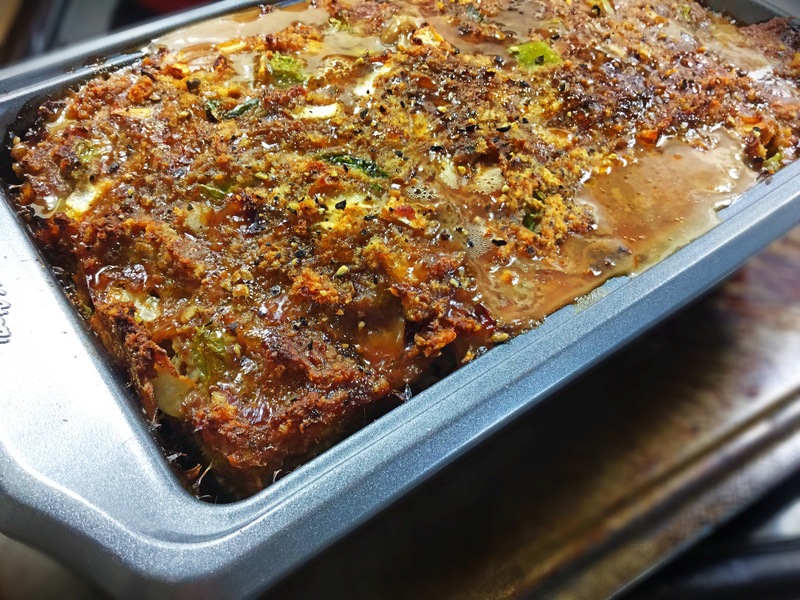 In one pan, lay thick slices of meatloaf down and slightly cook each side, as to create a bit of a ‘crust’. Lightly coat each slice of bread (on both sides) with a thin spread of mayonaisse. Then add a good helping of the warm Bourbon Bacon Jam to one slice. 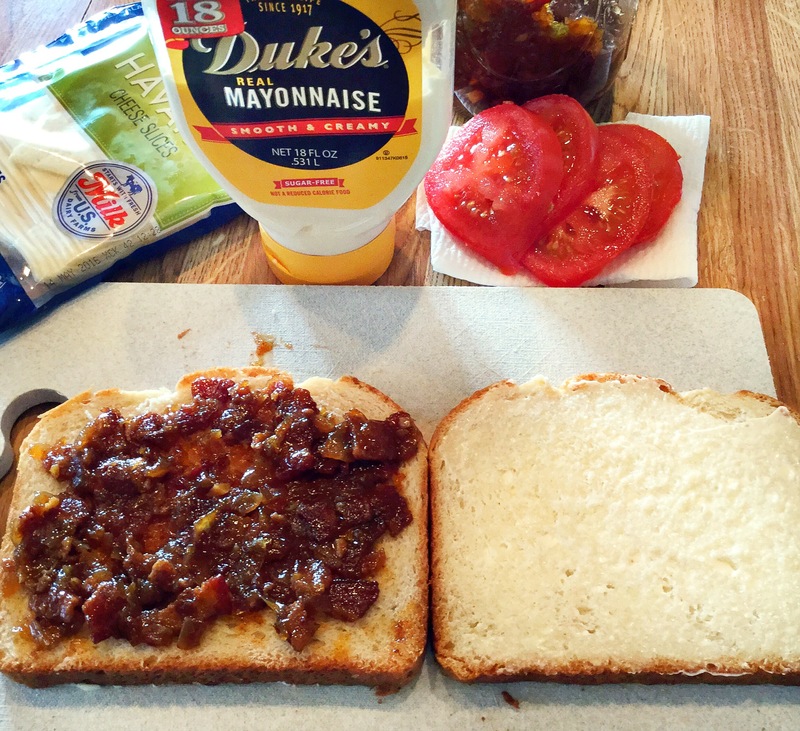 Transfer the mayo’ed slice to your second hot pan, top with the Caramelized meatloaf slices, tomatoes seasoned with a pinch of kosher salt & pepper, cheese slices and top it off with the second slice of bacon jam coated bread. Cook each side for about 2 minutes, till cheese has melted and the bread is golden brown in color. Cut on the bias and serve warm, enjoy! Everyone loves a good chips & dip as a snack, but sometimes they can taste too salty or artificial. Yuck….but did you know you can make your own with ingredients that you likely already have on hand?! Truth. A few fridge and pantry staples will make you the star of snack time! Heat your extra virgin olive oil in a sauté pan over medium heat. 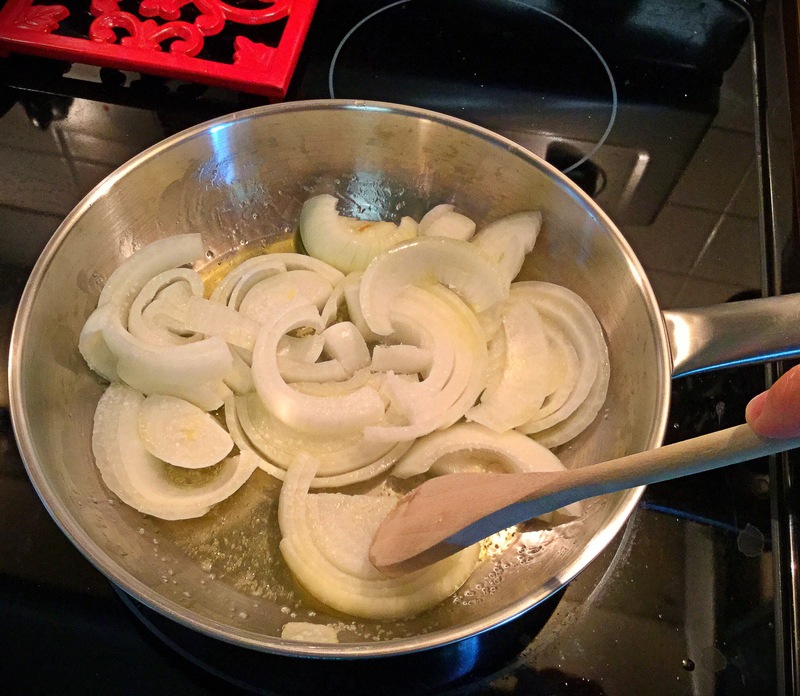 Once the EVOO is hot, add in your onion slices along with a pinch of salt. 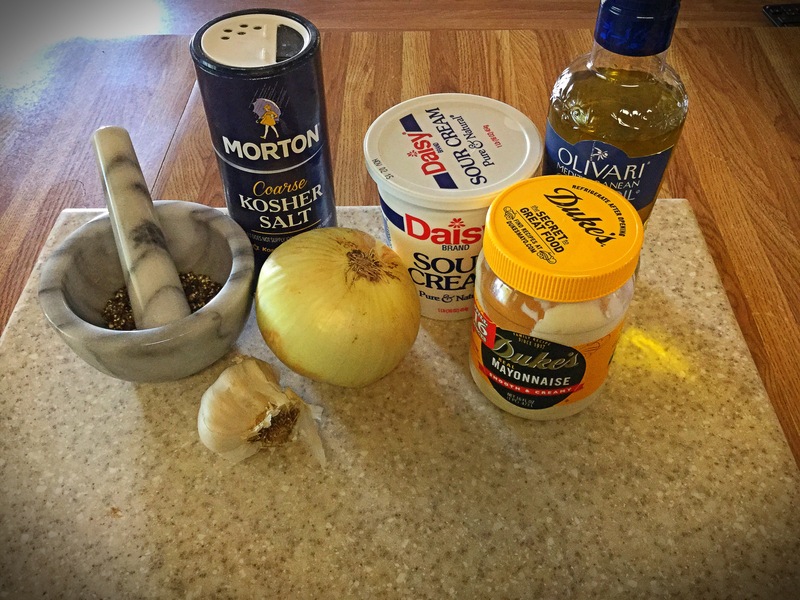 You’re going to cook these onions for at least 20 minutes, while stirring occasionally. You want them to darken and caramelize. I like to drop the heat a bit and cook a good 30 minutes +. 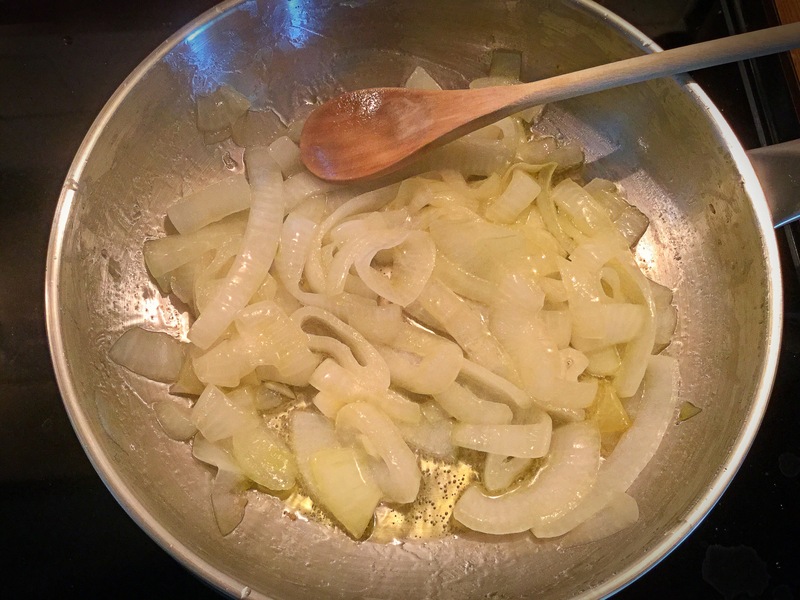 Once your onions have finished cooking, add in your minced garlic. 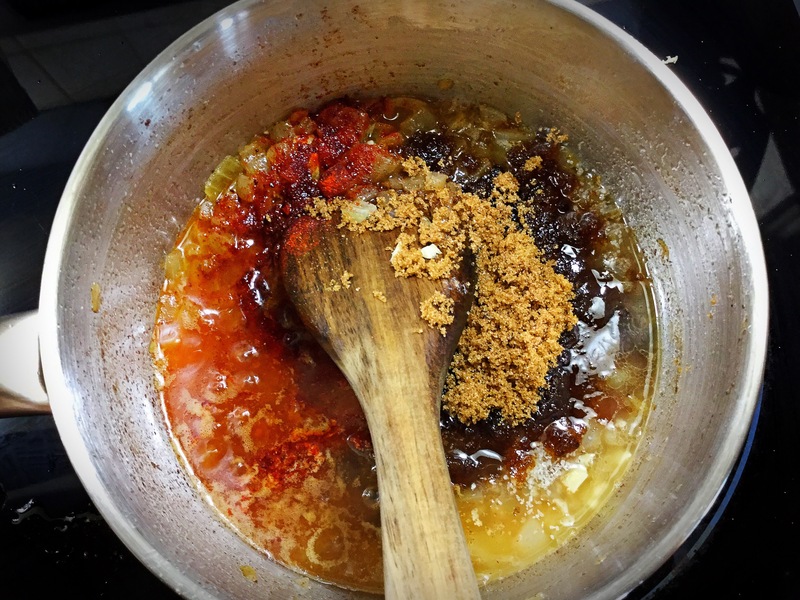 Give this a quick stir, take off the heat and set aside. 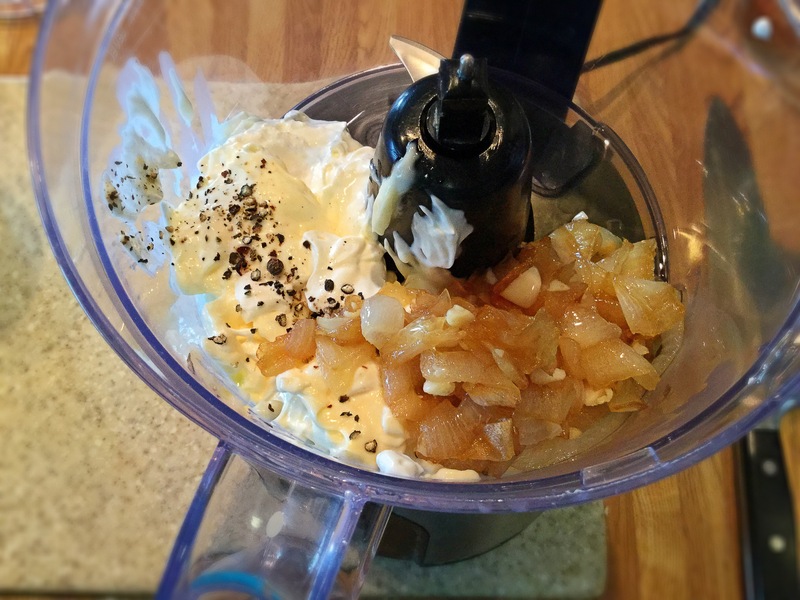 Next, in your food processor, add together the sour cream, mayo, 3/4th of the caramelized onions, onion powder and a pinch each of the salt & pepper. Pulse until combined. 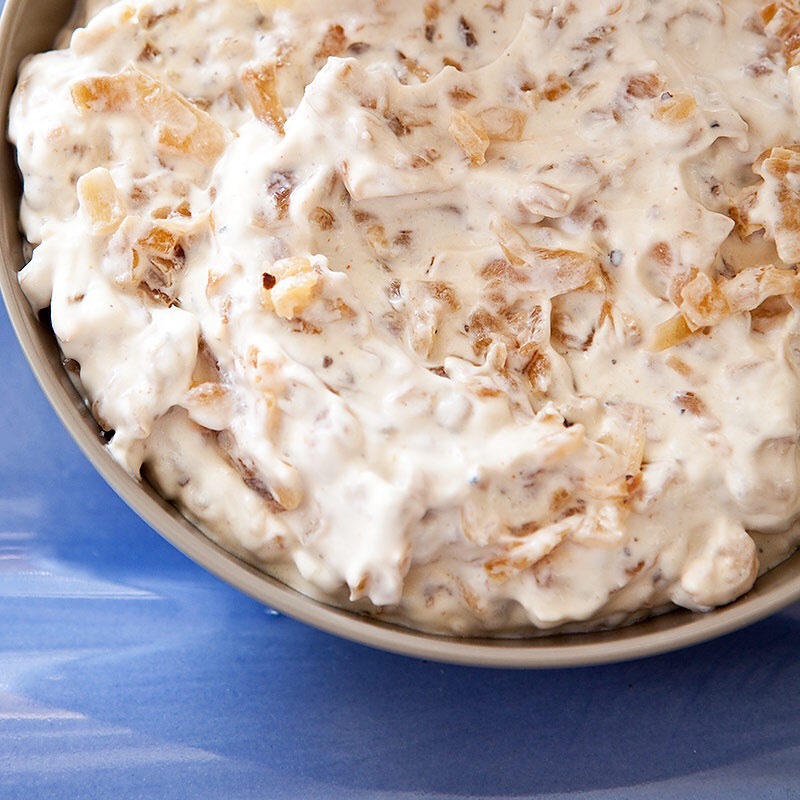 Roughly chop up the remaining 1/4th of the caramelized onions and fold into the sour cream/mayo mix. Keep in the refrigerator until chilled and serve with potato chips, vegetables or use as a sandwich spread! Enjoy! !